Bring back the big bold 60s in spray form! 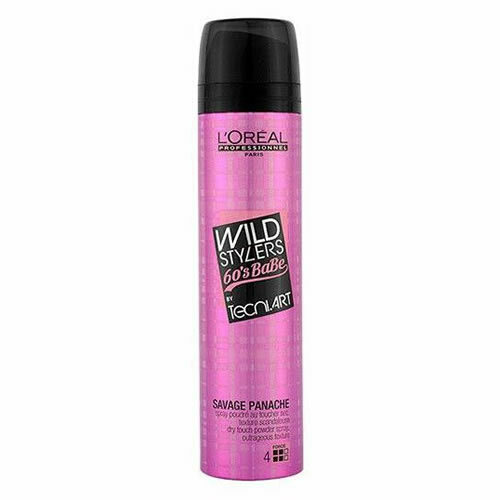 L'Oreal Professionnel tecni art Wild Stylers 60's Babe Savage Panache Dry Touch Powder Spray gets to work creating that perfect volume and textured look thanks to its micro-propelled formula that works hard to transform your clients into 60's babes! The dry touch powder spray achieves extreme volume and a dishevelled textured effect that is just perfect for finishing or enhancing a style. To use it to create ultimate root lift, apply to the roots before back-combing small individual sections and then use a bristle brush to smooth the look without crushing the height. Classic teasing brush with 3 rows of bristles and a tapering tail to make sectioning simple. Boar bristles combined with nylon pins give excellent brushing performance. The all wooden body is beautifully balanced for easy sectioning and rounded for comfort. Tail comb made from durable Delrin® plastic with specially designed teeth that make it ideal for back combing. YS Park's backcombing tail comb features 3 rows of teeth including an inner row of fine teasing teeth which make it easy to create shape and volume. Comes in 4 colours: Black, Pink, Red or White.